Line from the film: "I know for some women, men are a household necessity; myself, I'd rather have a canary"
Directed by Michael Curtiz (with an assist from both William Dieterle and William Wellman), Female, a 1933 comedy / romance, was undoubtedly scandalous in its day, but modern audiences may have a tougher time digesting the film’s finale than they will any of the “questionable” material that came before it. Alison Drake (Ruth Chatterton) is the CEO of Drake Motors, an automobile manufacturer. She took over the company years earlier when her father died, and her tenacity, coupled with a sharp business sense, has made her one of the most powerful women in town. When old college friend Harriet Brown (Lois Wilson) pays her a visit, Alison confesses to her that she’s too busy for a real relationship, and that’s she’d rather have a “canary” than a man in her life. But the truth is, Alison likes the company of men, and has enjoyed many one-night-stands with her more handsome employees. Thus far, her so-called “loose morals” haven’t hurt her reputation at the office. Far from it, in fact; her personal assistant, the elderly Mr. Pettigrew (Ferdinand Gottschalk), worships the ground she walks on, and her chauffeur Puggy (Huey White) will punch out anyone who questions her character. Then Jim Thorne (George Brent) enters Alison’s life. An engineer who developed a new automatic clutch, Thorne is offered a multi-year contract to leave his current job and work for Drake Motors. He accepts, but when Alison puts the moves on him, Thorne turns her down flat, saying he was hired as an engineer, not a “gigolo”. But Alison isn’t looking for Thorne to be one of her many conquests. To her amazement, she’s actually developing feelings for him, and for the first time in a long time, Alison Drake is wondering if being a successful businesswoman is all there is to life. From the get-go, Female sets itself apart from most movies of this time period by taking us into the board room, where a woman (Alison) is talking down to a bunch of men, criticizing them for a poor sales year. Hard-nosed and confident, Alison is a woman who clearly knows what she’s doing, and no matter how many phone calls she takes, or questions she answers, she never once wavers or hesitates. This attitude extends to her personal life as well. After the board meeting, she invites new employee George Cooper (Johnny Mack Brown) to dinner at her mansion, where they can discuss some of his new sales ideas. But instead of talking business, Alison sets about seducing Cooper (with the press of a button, her butler, played by Robert Grieg, enters with a carafe of Vodka, a drink that, we learn, was used by Catherine the Great to break down a man’s resistance), and he seems more than ready to take their boss / employee relationship to a much more intimate level. Of course, once back in the office, Alison is all business; when Cooper sends her flowers the next morning, she chastises him for mixing business with pleasure. It’s a blow for Cooper, who thought Alison had genuine feelings for him. But he isn’t the first man who’s felt this way, as we discover when Alison’s assistant, Briggs (Gavin Gordon), blurts out that he loves her during a meeting. His reward? A reprimand, followed by a transfer to the company’s Montreal office! Then, in the second half of Female, Alison meets her match in Jim Thorne, who isn’t impressed by her power or authority. And she has no idea how to handle the situation, especially when she finds that she’s falling in love with him. It’s at this point that Female veers off in a new direction, and without spoiling it, I’ll just say that while the ending probably made audiences of the 1930s stand up and cheer, modern viewers are more likely to roll their eyes when Alison makes her big “decision” at the end of the film. I’m not trying to frighten you away from Female. 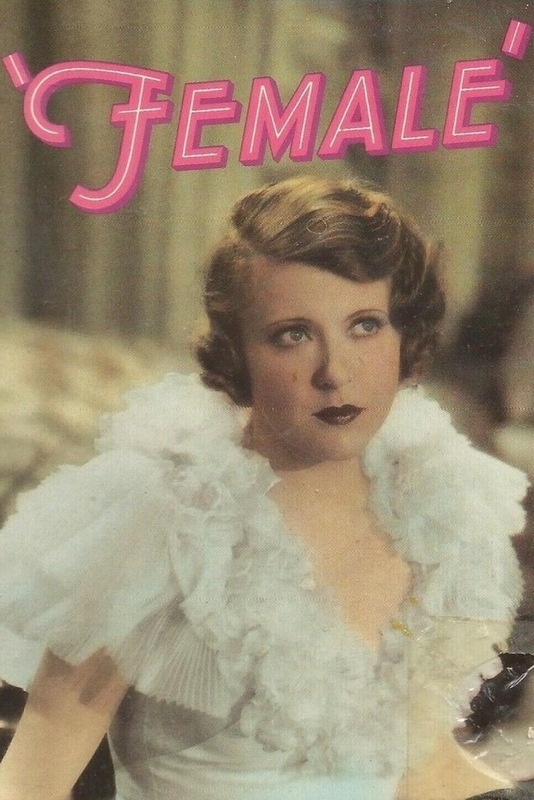 On the contrary, it’s a well-paced movie with sharp, witty dialogue and features an absolutely magnificent performance by Ruth Chatterton. It’s a pre-code picture that’s well worth seeing. Just keep in mind that, even though it was ahead of its time, Female is still a 1930s film, and as progressive as it seemed back them, its sensibilities were nonetheless steered by the era in which it was made. Odds are you’ll enjoy Female, but you may not like every single minute of it.